Nadia, who is a Licensed Practical Nurse, has been at the Children’s for almost 10 years and most of that timehas worked in the Otolaryngology-Head and Neck Surgery department.The team is made up of eight full-time and part-time surgeons, nurses, several administrative staff, and residents and fellows. Nadia's role in the department includes clinic coordination, assisting the doctors and providing them with test results, and helping families navigate their appointments. Her dedication to the department is easy to see. "I think we’re a really good team and I feel like I’m a good team player," she says with a smile. 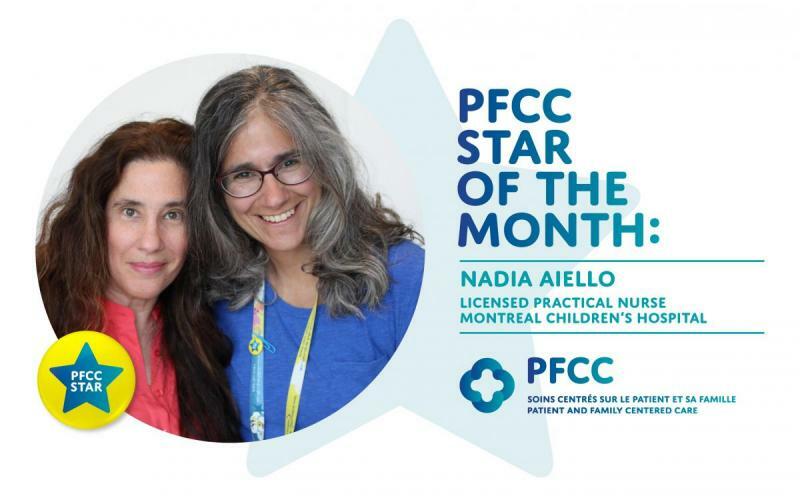 Nadia coordinates all the clinics in the department—some are weekly, others less frequent—and she has a key role in looking after patients who come to the Saliva Clinic and the Dysphagia Clinic. On average, she sees about 50 patients and their family members every day. One of those patients is Pearl, who at three years old has already had four surgeries for an inner ear problem. Her mother Tzorty says being able to count on Nadia means a lot. "I have only good things to say about Nadia," says Tzorty. "She's so nice and patient, and always approachable. The number of times we visit the hospital varies from one month to the next, but she always tells me to call whenever I need her, which is so reassuring." Tzorty says at home, her daughter loves to talk about Nadia when she plays. "She tells her dolls about "Nadia", and says she's really nice and will look after them!" When it comes to looking after the patients and families who come in for appointments, Nadia values the role that parents play. "At first, we're like strangers to their kids, but it’s really nice when a family comes back for a second or third appointment and mom or dad says to their child, “You remember Nadia, she helped you out last time.” It makes me happy to see familiar faces and build a rapport with the families. It's nice to know you can play an important part in helping their child get better.